Cat’s Colours is a beautifully illustrated story which introduces young children to colours. With it’s simple text and bold illustrations it’s the perfect book for a nursery classroom or home library. The Story: It’s a grey day so Cat goes for a walk to look for colours. She finds natural items that are green, red, blue, purple, orange, black and yellow and as she walks she gains a spot of each colour on her white coat. At the end of the day she finds herself a place to sleep and as the sun rises next morning Cat gives us a colourful surprise! Cat is walking across the cover of the book and her friendly, smiley expression invites you to open it and follow her. The first two double spreads are grey but then Cat finds green before going on to smell the red roses. The story continues and introduces colours from natural elements including the moon, a pond and a butterfly. Airlie Anderson’s illustrations are bold and eye-catching and the final spread is beautiful. The day is still grey and Cat still has her coloured spots plus… (we’re not going to spoil the ending!). This is a lovely book to include in a topic on colours. A fun follow up activity to the story could be to cut out a cat template on white paper so that children can recreate Cat using paints, pens or crayons. My daughter chose to cut out and stick coloured spots out of sticky paper and tissue paper. 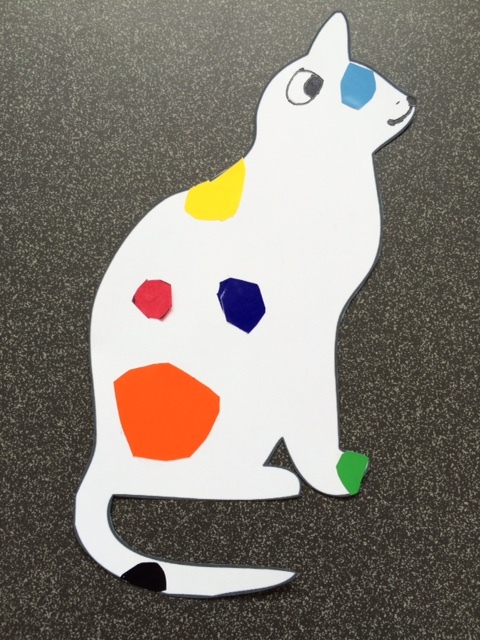 This extension activity can be used to discuss the colours that Cat collects and consolidate the children’s learning. They could then collect different coloured objects that match the colours that Cat finds in the story. 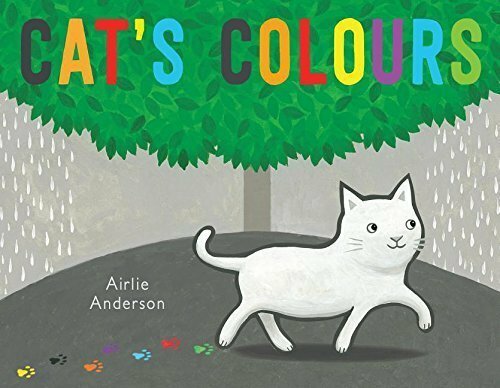 The language in Cat’s Colours is also simple enough for non native English children to understand and the story could also be used to introduce them to new vocabulary. You could create matching flashcards with colour spots on one set of cards and the objects that Cat sees on the other then ask the children to match the colours to the objects. Often the really simple stories stimulate the most learning and we would definitely include this story in a nursery / reception class topic on colours. Thank you to publisher Child’s Play for sending us a copy of Cat’s Colours. We were not asked to recommend the book but it is such a beautiful book for little people to enjoy whilst learning their colours. Interesting color book. Should entice young children to learn those primary colors. Nice review. (FYI) The illustration does not show but maybe 1/4 inch of the bottom. Thanks Sue. I’m guessing that you are talking about the book cover on the Amazon link and not the cat? Unfortunately I can’t do anything about the link.